As you know that Kheer /firni / payesh / pudding which ever name you call it. It is a very authentic Bangladeshi Dessert. I make it mango flavour to give twist. In Ameer kheer / Mango Rice Pudding you can use fresh mango puree or pulp. But in Australia mango is not in season so I used tined mango pulp. Bring the sweetness on Eid day with Ameer kheer / Mango Rice Pudding. 1. Wash the rice and soak in water about hour. Strain the water. 2. Blend rice with half litre milk. 3. Boil the rest of milk, cardamom and cinnamon together and bring it to half amount. Stir occasionally. 4. Add rice mix in boiling milk and stir it. 5. When rice is cooked and milk becomes your desire constancy, add mango pulp, sugar and dry nuts. 6. Stir it and cook it till sugar dissolves. Remove Ameer kheer / Mango Rice Pudding from heat. 7. Pour it in serving dish and let it cool down. Put it in refrigerator. 8. 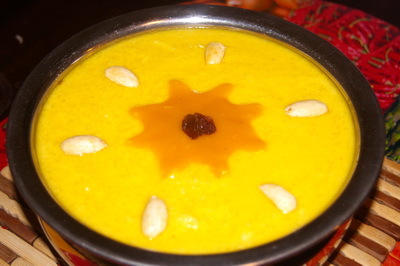 Serve Ameer kheer / Mango Rice Pudding chilled. How many people will fed in that amount?